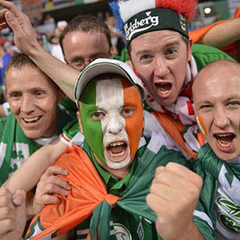 Kiev - Ireland's cheerful legions of singing fans have won a UEFA prize after winning millions of admirers at the European Championship. UEFA said its president Michel Platini will visit Ireland soon to present an award to thank the "absolutely fantastic" fans. UEFA general secretary Gianni Infantino said, "everyone was very impressed with the fans of the Irish national team." The Irish fans' singing of "The Fields of Athenry" filled stadiums in Poznan and Gdansk with emotion despite the team being mostly outclassed in losing to Croatia, Spain and Italy. "The Fields of Athenry" is a folk song set during the 19th century Irish Famine about a fictional man from near Athenry in County Galway sentenced to be transported to Australia for stealing food for his starving family. Italy goalkeeper Gianluigi Buffon said Ireland's fans "should be applauded." Buffon said: "They are people full of pride and happiness who accept defeat and victory in the same manner."